Thanks for the photos, I will do the same as you have done. My hardware is located 200 miles from my current location, I used the link from tooseevee (thank you, tooseevee) order turn button assortment from Ebay. Finished up the front wiring and took her for a spin! Alignment feels good, but I need to practice a bit to get the feel of that steering damper again. Not to mention being a bit more careful in first gear. Couple of minor cosmetic things to attend to, then off with the missus for a canyon run. That's a beauty Heloego! I'm glad to see you've finally got a rig that will work well for you and the misses. Brings to mind an old adage; quality is remembered long after price is forgotten! And now you've got "sweat equity" too. I know I always enjoy things more after having them apart and back together again. Got any more pics, maybe from different angles? Btw, I just saw a post of yours from June - '17 where I think you were just about to order your Cozy. I just remembered that I got a new hack for christmas, a jewel from 1960! Long as we're "showing those sidecar rigs"! Great looking rig, Triumph should be up to the task of tugging it up any mountain. The ride yesterday definitely was fun. Nooo problems with getting up to speed and holding it there. Only drawback at this point is due to the cold that steering damper is stiff, so right-hand turns were a bit of a pain. That thing is nothing more than a shock absorber, so I think I'll do some research for something a bit less stiff maybe? It's back to work this week, but I'll post some more pics later. They're all technical nowadays though! The bracket for the unit in the video requires two mounting holes in the frame. My 2018 does not have those holes. I checked at the TEC website and they're sold out of yours and don't show one for the 2018 yet. Wow, My sidecar hooks into the two holes on the right side of the frame, same place that a popular ign sw. relocation bracket goes to, or other steering dampeners. I got the TEC lefty bracket for sidecar accommodation. Del Boy got a lefty since he has the ign sw on the right. I had first ordered a Norman Hyde dampener but it attached at the right side location and sidecar mount obstructed it. Much more expensive too. Triumph must've changed that when they went to the water cooled, hi-techie bike in '16... I'll have to take a look at one next time I'm at the dealer. There must be someone by now making a good one for the newer Triumphs? One more thing in case it comes up, is that the front bolt on mine has a tendency to rub the main wiring harness when you turn the bars all the way. I had to make a little shield from a plastic pop bottle and tape over it. Can't tell it's there now! Since I don't have the two holes required for the TEC mount I measured the down tube and get 33.22mm diameter. 33mm clamps are available for relatively cheap, and so are the dampers. Most I've found don't show or include any additional parts (like an extra clamp or hardware), so it looks like I'll have to cobble a kit together using parts from EBay and my local hardware store. This project may be delayed a while, since I am tapped for the local Jury Pool and will have to call in daily to find out if I'm required to do my civic duty. I've dodged the bullet for the last two occasions, so I expect I'll have to take one for the team this time. I cheated and bought a 2017 Ural Patrol. Felt that I could abuse it a bit more than a 500 single C-5. 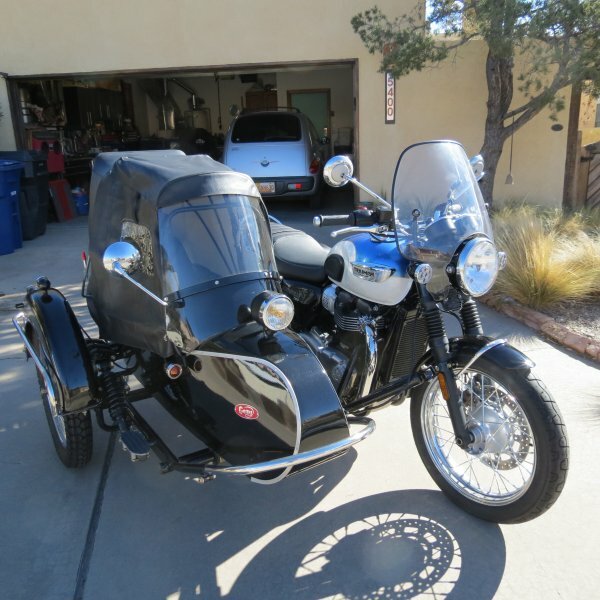 Plus with the Ural and a 2008 Bullet plus if I get the 650 Interceptor I'd like to buy I have it all covered. Nice Ural Coot, that color is awesome! I took my 3 wheel license class driving a blue one. My rig at Fort Myers,FL bike night today. The little girl wanted to sit in the sidecar so I took a picture of her. I got to park in the Brit bike area.